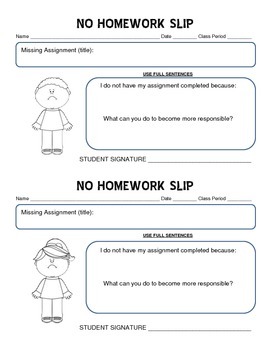 I have my students turn in this form when they fail to turn in a homework assignment. I print it out on green paper and they know they are to turn in a "green slip" if they don't have their homework. This helps them become more responsible and having a 0 becomes a tangible concept. It also helps when communicating with parents as to the reasons why they student hasn't completed their homework.